Made from durable 3mm recycled polythene plastic, Hay & Straw Caps are designed to keep large bales of hay & straw safe and dry from rainfall for well in excess of 10 years. 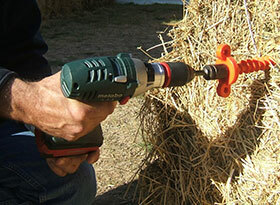 With a simple and quick application, Hay & Straw Caps can be safely applied at ground level. Once you have applied your Hay & Straw Caps to a bale, you can stack your bales whichever way best suits you. Bales which have the Hay & Straw Cap on top will provide a roof for the bales below. 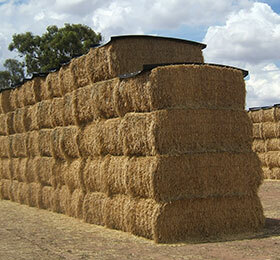 The edges of the Hay & Straw Caps are folded which prevents any rain water from draining in-between the bales. The Hay & Straw Caps are also extremely durable in high winds, making them a favourable choice for farmers who have previously used tarpaulin. Our Hay & Straw Cap is designed to cover a standard six string bale from a 1200mm wide chamber stacked on its bands. It will also cover the larger Heston bale stacked on its edge. If you require a different size, please contact us for a custom size quotation. To Yorkshire addresses, depending on quantity, we can deliver in our vehicles at a time to suit you. For UK postcodes outside of Yorkshire we can arrange delivery through our National distribution partner. Delivery options are next day delivery to 5 days. For deliveries outside the UK please contact us to make arrangements. Collections are also possible if you prefer. All deliveries are chargeable and quotes will be given before delivery arrangements are confirmed. Hay Caps sit inside one another so they can easily be stored when not in use. Roughly 100 caps stacked on a pallet is the same size as one bale of hay or straw.